After the Super Bowl, the MVP is usually presented with some car and if he's a pitchman for another auto maker, it can be kind of awkwardly funny. But in Madden NFL 25, your quarterback will go up there and graciously accept that GMC truck, dammit. 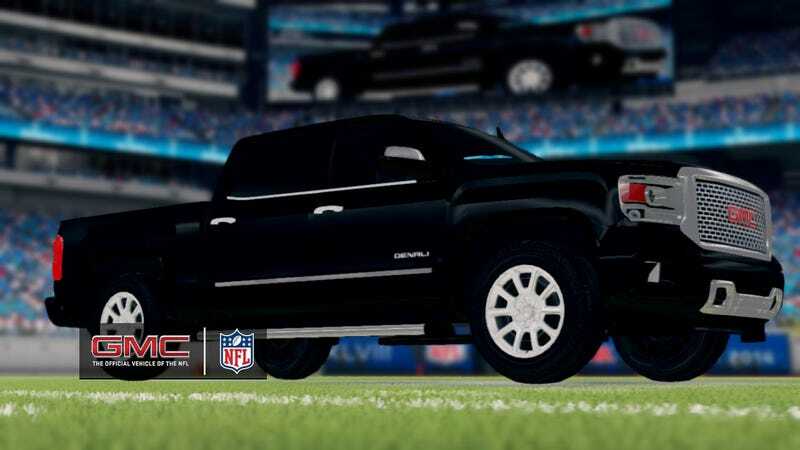 GMC is the official vehicle of the NFL, and that relationship will now be reflected in Madden because realism money. "The vehicles will appear at various points during gameplay, including after a Super Bowl victory. Just as in real life, the game’s MVP will be awarded a vehicle. Four big ol' 'Merican trucks will be featured, including the 2014 Sierra Denali (pictured), as well as the Yukon, Acadia and Terrain models. "The vehicles will appear at various points during gameplay, including after a Super Bowl victory," says a news release from GMC. "Just as in real life, the game’s MVP will be awarded a vehicle." GMC also will be sponsoring what sounds like the old Madden Moments Live series, except now it's called the “Never Say Never Moment of the Week." These are basically scenarios from real NFL games that you can attempt to repeat in Madden. In-game advertising is hardly a new concept in sports video games, even those not made by EA Sports, but Madden is the series least able to get away with it. Every time it does something like this (remember the Old Spice Swagger rating?) people tear their hair, throw things and wave the bloody shirt of NFL 2K5. Feel free to do so in the comments.